Flooding caused by a burst water pipe left city centre roads in Derby looking like rivers and forced guests at a hotel to leave via a ladder. Homes and businesses in the city were left without a water supply and five schools were forced to close. Severn Trent apologised for the burst in King Street at 05:30BST. The company said the majority of homes and businesses affected have now had their water supplies restored but road closures remain in place. A spokesman said they had taken 1,000 calls from people with little or no water. He added part of King Street is likely to stay closed throughout the weekend while repairs continue. The flooding caused disruption at the Jury's Inn hotel, where a lift was closed so guests were asked to use a ladder to access the car park. Carlyle Infant and Nursery School, Ivy House School, Gayton Junior School, St Joseph's Catholic Primary School and Saint Benedict Catholic Voluntary Academy were all shut. 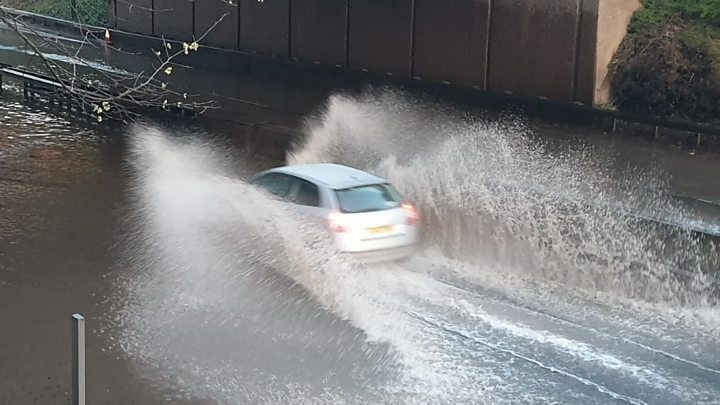 The burst main also caused water to flow down to another road, the A52 St Alkmund's Way.